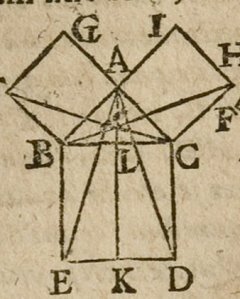 The "Forty-Seventh Problem of Euclid's" first book of Geometry contained a mathematical theorem so complex that when Pythagoras solved the problem he exclaimed; "Eureka" which signifies "I have found it"! It has been adopted as a symbol of a Past Master. 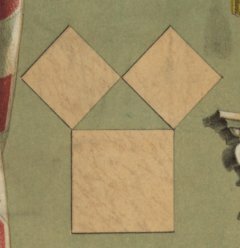 It teaches Masons to be general lovers of the arts and sciences. Albert Pike (1809-1891) the great 33.degree Freemason, then goes on to explain that this geometric figure is the basic for ALL masonry! But how on earth can a geometrical and mathematical figure work as a basis for a secret community now consisting of about 6 million members? What did Albert Pike mean by that statement? Again we can have a look at Orffyreus and his little poem from 1717. In Apologia Poetica he writes in his cryptic alegorical poem that "Saturn, Mars and Jupiter are ready to join any battle". 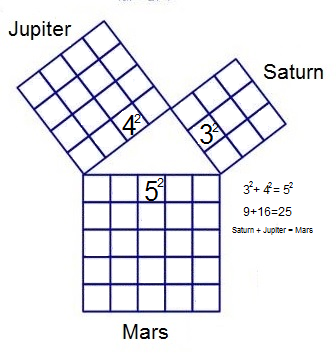 So what is special about Saturn Mars and Jupiter, and does it have anything to do with masonry and Pythagoras geometry? I think Orffyreus was reffering to Pythagoras formula and the 3-4-5-triangle. And by looking at the nexy figure, it seems like someone knows that this had something to do with the ancient Egyptian Gods and ancient secret methods. 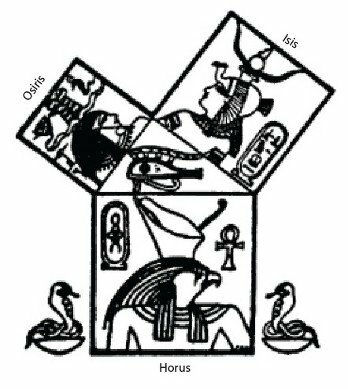 Isis + Osiris = Horus. They are Egyptian Gods from a time before Pythagoras. What could that indicate? And why does masonic lodges use Egyptian symbolism, and why do the Rosicrucians and the modern A.M.O.R.C claim that they hide secrets from ancient egyptian mystery schools, over 3300 years ago? Orffyreus codes reveals the answer! Close-up of one of George Washingtons memorial paintings.